Who are my Swiss Chard lovers? 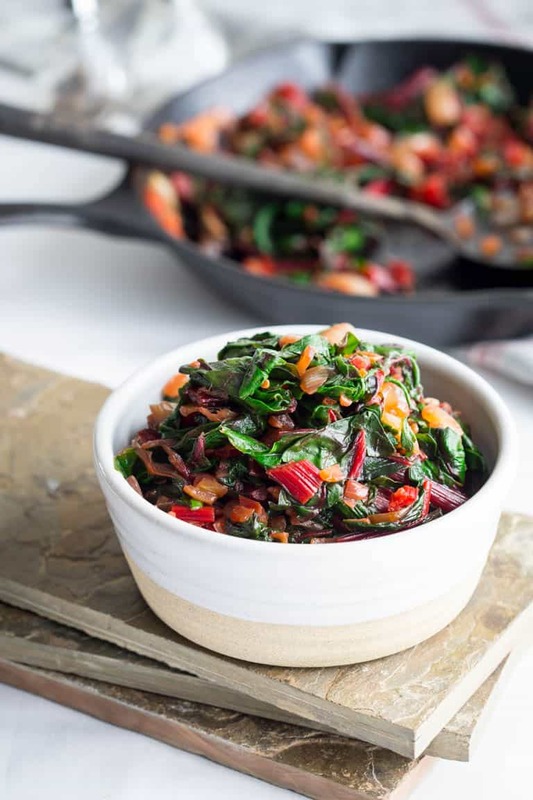 If you love Swiss Chard you will fall head over heels for this Simple Sautéed Swiss Chard Recipe. 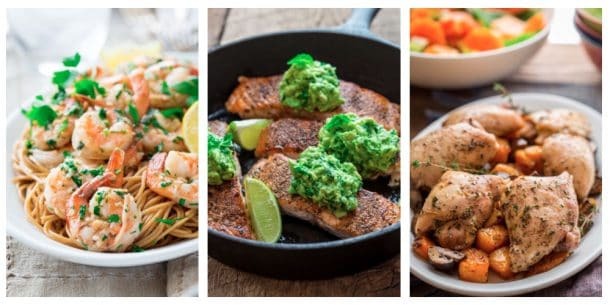 It is so easy to prepare, and only 80 calories per serving. Naturally vegan and only 7 grams net carbs per serving. If you are stuck in the rut of baby spinach from a plastic box every week, it’s time to get on the Chard train! Don’t be intimidated by it, it’s not as scary as it looks and it is so good for you. 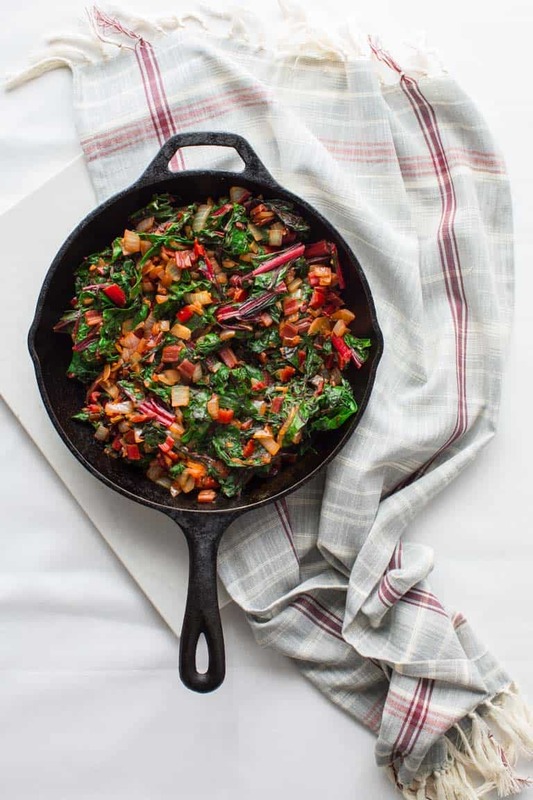 Before we get to the tips on how to make this simple sautéed Swiss chard, here are some useful facts about it! Swiss Chard is a leafy vegetable that is related to beets. It has crunchy stems that are commonly red, though can also be white or yellow. The leaves range in color from dark green to reddish green. The flavor is similar to beets and spinach, with slight bitterness, and strong earthy flavor. What Part of Swiss Chard is Edible? Swiss Chard is entirely edible, including the leaves and stems. The stems need a little more cooking time than the leaves because they have a lot of cellulose that needs to soften for longer. The leaves cook quickly. 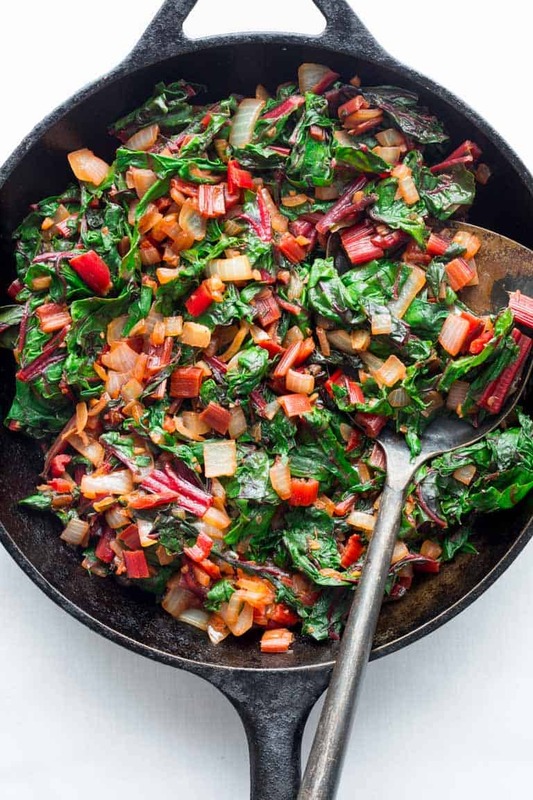 Swiss Chard can be eaten raw, though it contains oxalic acid, so it may be better for you to eat it cooked. Cooking it also makes it less bitter. I like to pair it with sweet onions, garlic and even a splash of vinegar. While it may be counterintuitive to add vinegar to make it more palatable, the acidity in the vinegar balances the bitter taste in the chard and the overall effect is more harmonious. 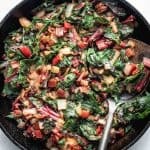 What are the Health Benefits of Swiss Chard? Swiss Chard is naturally low in calories and carbohydrates but high in Vitamin K, Vitamin A and Vitamin C.
What is the difference between Swiss Chard and Rainbow Chard? Chard cooks down a lot when you cook it, so I like to make a big batch of it. If you are not sure if you are going to love it, you can cut this recipe in half. If you do so, keep in mind that the onion mixture in step two will cook a little faster. To cut the Swiss Chard, lay a few leaves on top of each other on the cutting board, and remove the stems. Chop up the leaves and place them in a salad spinner. Repeat until you have a stack of stems and a spinner full of greens. Fill the salad spinner with water, swish it around and drain it. If it is a particularly muddy or dirty batch of chard, wash it again. Spin the chard greens dry. Rinse your stack of stems and trim off the ends if they are dry or discolored. Chop the stems up, just like you would celery. Because the stems are high in cellulose you will need to cook them longer than the greens. I love to add flavor and sweetness by cooking the stems with a chopped sweet onion. They cook at about the same rate and the onion really balances the flavors of the chard. Once the stems and onions are softened and the onions are starting to caramelize a bit, then add the green leaves at the end, since they don’t need as much cooking time to become tender. To wilt the greens, splash in a couple tablespoons water and cover the skillet with a lid. Note: If you don’t have a very large skillet with a lid you can do this in a wide Dutch oven instead. Once the greens are wilted down, remove the lid and continue cooking and stirring until the greens are tender. If you want to, drizzle on some Balsamic vinegar. Other ways to add a bit of pizzaz are to add a handful of toasted almonds or pine nuts, gloden raisins, dried cranberries or dried currants, or even a little crumbled feta or goat cheese. Fresh herbs can be added as well. Mint goes well with feta and pine nuts. Try it! This Balsamic Chicken would be nice. This sautéed swiss chard would be a super yummy and easy accompaniment to these Lemon Caper Salmon Cakes. For a weekend meal, try this spatchcocked chicken and a batch of simple saffron rice. Or for a vegetarian meal, serve this with my pumpkin brown rice risotto. Thanks so much for reading. Let me know if you make this recipe by coming back and leaving a star rating and review! It is so helpful! 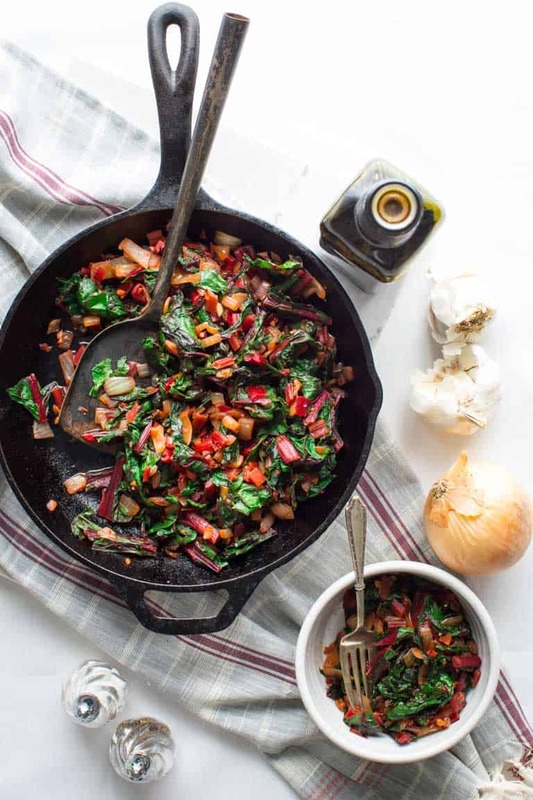 Simple Sautéed Swiss Chard with onions, garlic and a splash of balsamic vinegar. A healthy low calorie side dish. Heat oil in a large heavy skillet over medium high heat. Add chopped chard stems, garlic, onion, salt, thyme, nutmeg and pepper and cook, stirring often until the onions are starting to brown, 6 to 8 minutes. Add chopped cleaned Swiss chard leaves, 2 tablespoons water and cover. Let wilt, 2 to 4 minutes. Remove lid and continue cooking, stirring occasionally until the Swiss chard is completely wilted and softened, 1 to 3 minutes. Remove from the heat and drizzle with balsamic vinegar if using. Serve hot. Simple is right! Not sure it could get much easier. Looks delicious! So colorful and delicious. Can’t wait to make this for my family! We love any kind of greens. I always wondered if it was from Switzerland! 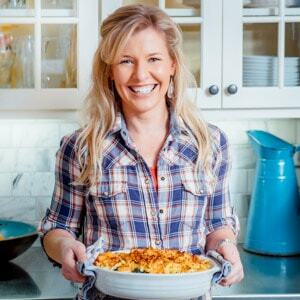 I love Swiss Chard and this simple recipe is perfect! How beautiful! I just love the color and how easily this Swiss chard comes together. Definitely a wonderful side. 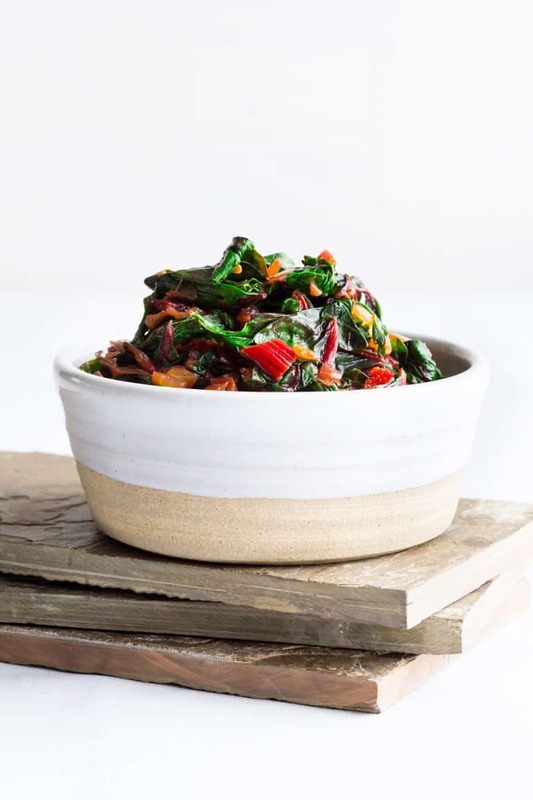 Oh yum, I’m a swiss chard fan and your combination of flavours sounds like a winner – definitely bookmarking this to try soon.